Every language has words that are used in a different way than you think. These ‘slang’ words are like a secret language, and can be difficult to decipher! 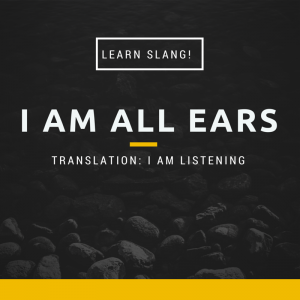 This month’s slang is all ears. You might hear people say, “I am all ears” and wonder, how can that be? This person has the right number of ears, I must have heard them wrong. If someone tells you “I am all ears,” they are telling you that they are ready and willing to listen attentively. For example, let’s say that your friend is having a problem, and you want to know why she is not feeling well, you could say, “You can tell me your problem, I am all ears”. Try to use this slang expression in your own conversations! esl-blog american english, conversation, english language, English tips, ESL, learning English, Slang words, strange words. permalink.